I want to thank Lyell Henry for his recent donation of postcard photos viewed in the “Share your History” of this website. 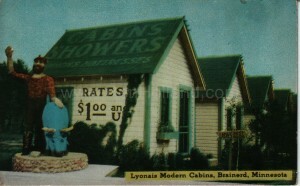 Lyell shares a varied background and a common interest in early tourism, especially as it relates to motels, cabin camps, tourist courts, and highways. He has generously donated digital images from his collection and has been an appreciated promoter of my book, The Early Resorts of Minnesota. Lyell is Emeritus Professor of Political Science at Mount Mercy University in Cedar Rapids, Iowa. He has written two books and numerous articles on various topics of American popular culture, early highways, and roadside commercial architecture. He is an active member of the Lincoln Highway Association, the Jefferson Highway Association, and the Society for Commercial Archeology. He is the editor of the quarterly Jefferson Highway Declaration and is currently writing a book on the Jefferson Highway through Iowa. Lyell has two published history books, Was This Heaven? A Self-Portrait of Iowa on Early Postcards and Zig-Zag-and-Swirl: Alfred W. Lawson’s Quest for Greatness. Below you can view a video slide show of Lyell’s 70+ postcards (which can be paused, etc. ), or click here to search the “Shared Photos” section for the complete alphabetical list of these early roadside motels, etc., including some still operating. This entry was posted in All blog entries, Minnesota Resorts, Minnesota Tourism, Readers' Stories. Bookmark the permalink.